Fatigue failure occurs when a crack grows as a consequence of cyclic stress. It propagates through the component until the remaining cross-sectional area is unable to sustain the applied load. At this stage the remaining metal fails due to overload. Assuming the component to have been designed to conservative engineering principles, the final fracture area will be somewhat less than 20% of the total area. Fatigue fractures are often easy to identify, the fracture face has an appearance known as ‘beach marks’, rather like ripples in sand. The example below shows them. The reason that people believe that fatigue fractures occur ‘out of the blue’ is that they have never inspected parts that are liable to fail. In most cases the crack is propagating for a considerable time before failure, so could have been detected by looking at it. The message is simple – inspect regularly. 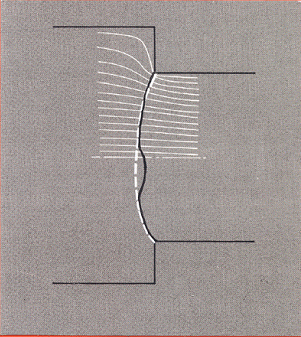 On the right is the zone in which the crack has been propagating under the influence of cyclic stress. This stress can occur in many ways, including vibration, rotation, bending and many more. Its appearance is characterised by the lines on its surface, called ‘beach marks’. These form as the crack moves from right to left across the component, initiating at the extreme right. On the left is the final fracture zone. As the crack propagates from the right the force is carried by an ever-decreasing area. Thus the stress in the remaining area increases, until it exceeds the strength of the material. At this point the remainder fractures. A final fracture area as large as this would be quite unusual in practice. 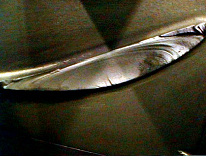 A real life fracture, in a compressor blade with an aerofoil section, included here because of its ‘textbook’ appearance. The initiation point is at the bottom in the photograph. Beach marks can be seen where the crack has propagated upwards, with the final fracture a small area at the left and right extremities and along a narrow line at the top. 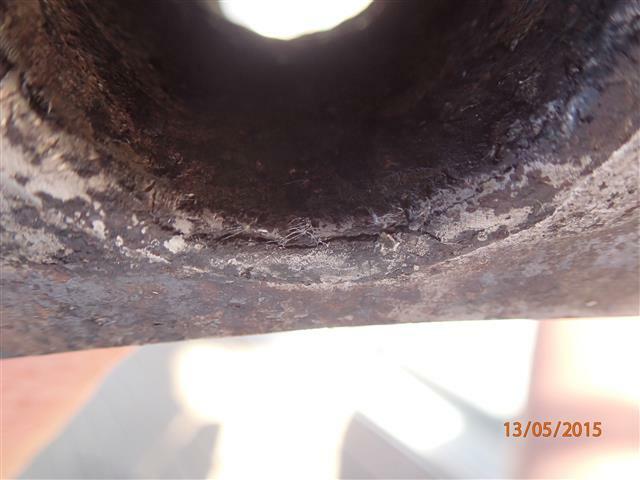 During a rig inspection by Holman Rigging in 2013 a lower shroud from a sloop rigged Halmatic 30 was found to have two broken strands. The rigging was supposedly replaced in 2006 bythe previous owner. The failure occurred at a swaged joint on a T-ball fitting at the upper end of the shroud. Two strands of the 1 x 19 cable were broken and unravelled from the cable. The swage was straight and appeared to be well made. I checked that a projection of the line of the swaged joint passed through the bearing point of the T-ball. This was the case, showing that the T-ball fitting was correctly aligned. If not the case the wires at one side of the fitting would be more highly stressed than on the other, a possible cause of fatigue. 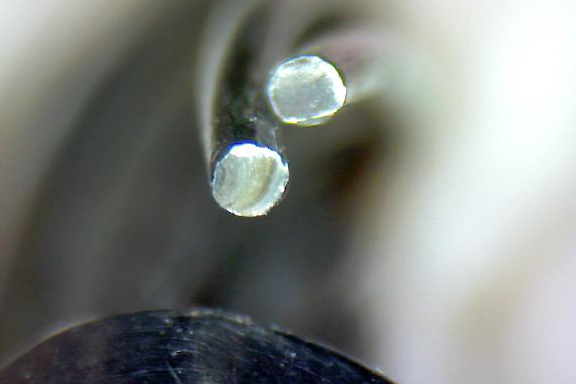 This view shows two wire strands to have failed about 2 – 4 mm inside the swage. This was a well designed component with a tapered OD, presumably to ensure that swaging did not continue right to the end, avoiding a sharp edge. See the case history below, on a failed forestay, for an example in which the swaged fitting was less good. A close-up view of the two failed wires reveals beach marks on the lower one, whilst the upper is highly polished. On the lower wire the crack initiated at the left. Beach marks are indicative of progressive crack growth and are typical of fatigue. There is a small wear scar coincident with the initiation point, probably caused by one wire rubbing over another. 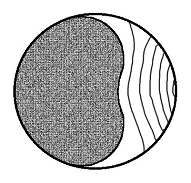 This is a typical stress raiser that might be the initiation point of a fatigue crack. I cut the swaged joint open to view the internal condition. It had been made well with plenty of extrusion of the fitting into the lay of the cable. The fitting was straight, with no ‘banana’ shape nor offset that would preferentially load the wires on one side. Both are well known causes of fatigue in rigging. In view of this, it is most likely that fatigue occurred due to undertightening of the rig, probably the most common cause of this type of failure. Wear scars are a common initiation point. The owner confirmed later that slackness in the rig was the prompt for the inspection. No fretting was visible inside the mouth of the fitting, again confirming that this was a quality item, well made up. However it was apparent that at least two other wires had broken, both showing some signs of fatigue. This photograph shows a forestay from a yacht whose rig failed on its mooring. The owner was in the habit of freeing the backstay when leaving the boat to avoid causing a permanent bend in the mast. It is a perfect example of fatigue failure in cable. You can see that the cracks started at the top, where some strands have been broken long enough for slight corrosion to have occurred. Fracture progressed towards the bottom, where the last couple of strands show no sign of fatigue. 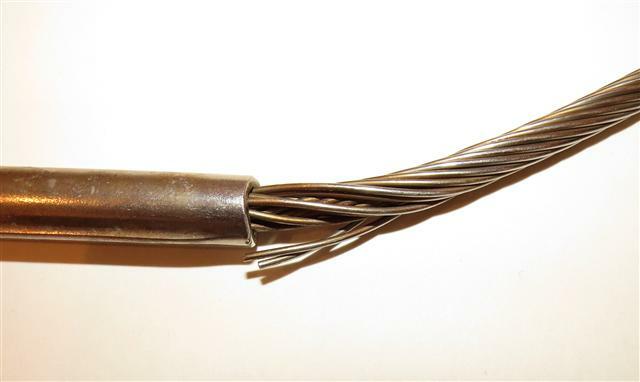 Of the 19 strands only two do not show fatigue.This expensive failure could have been prevented easily at any time, by examining it or perhaps just by feeling the cable with a finger, when the broken strands could have been detected. The first strands probably failed some months before the mast fell down. 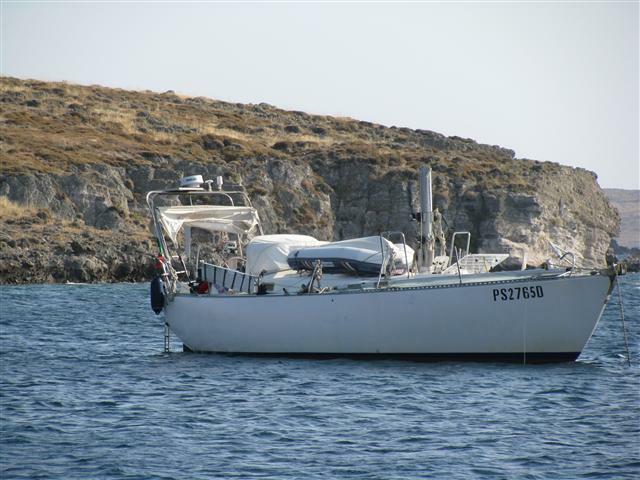 The 14 metre Italian yacht ‘Violablu’ was dismasted in July 2009 between Limnos and Lesvos. She was exceptionally well-found and her rig had been inspected visually in the same year. The incident occurred in about 25 knots of wind when the mainsail was double reefed and the genoa partly furled. Nobody was injured in the accident and consequential damage was limited to pulpit, bimini and other minor parts. The mast, sails, boom and rigging were released from the boat by removing clevis pins from the turnbuckles. Loss of the rig was initiated by fracture of a tang connecting a lower spreader to the mast. This had been fabricated from sheet stainless steel about 6 mm in thickness. 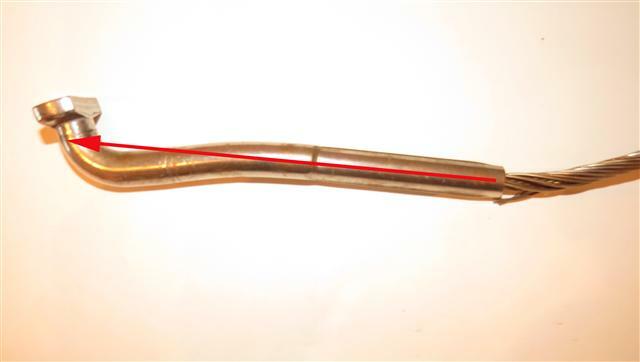 Direct bolting of the cable eye to the tang in this way allows rotation about the clevis pin but movement in any other direction will bend the tang. 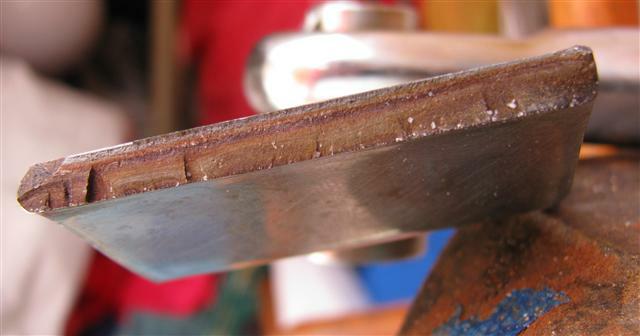 Repeated bending of the tang over years is probably responsible for the failure. Stress would have been highest at a point nearest to the mast. The fracture face is characteristic of fatigue. The crack initiated simultaneously along the lower edge, as evidenced by the 7 or 8 vertical marks, known as ‘ratchets’. The crack had been growing for some period of time, allowing mild corrosion to progress and cause the typical orange-brown colour. The bright line at the top of the face represents the area remaining when final fracture took place. 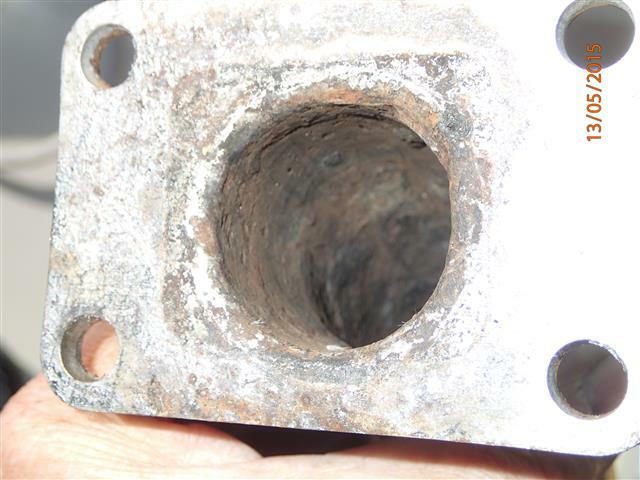 Inspection by dye penetrant methods could have identified the presence of a crack in an area that was particularly difficult to survey by eye. 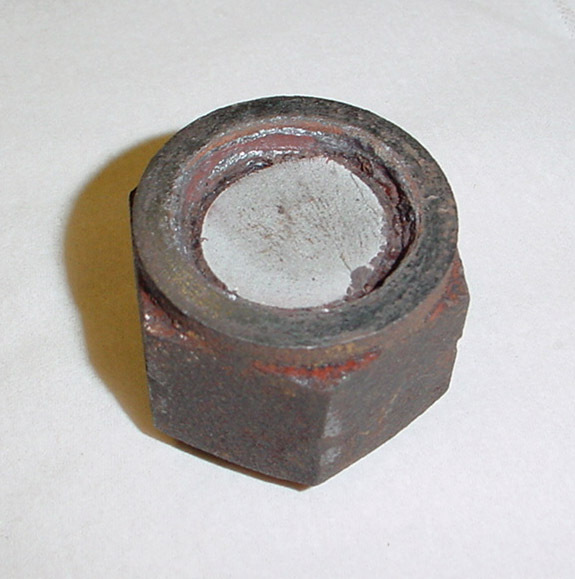 Fatigue is common in bolts, where the primary cause is undertightening. 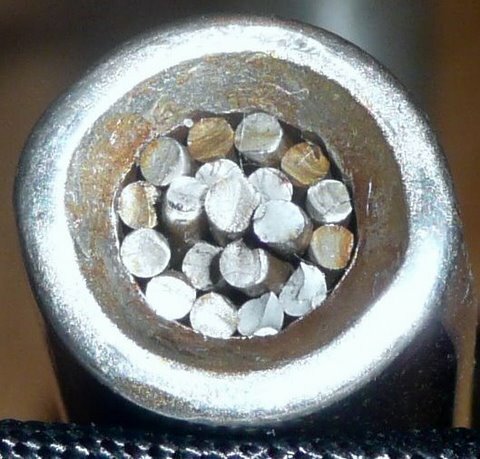 The crack is initiated at a thread root, in this case at the left of the photograph, and propagates until the remaining metal is insufficiently strong to carry the load, at which point it fractures. Because the bolt is undertightened the final fracture area is small, here on the right it is only a few percent of the total cross sectional area. 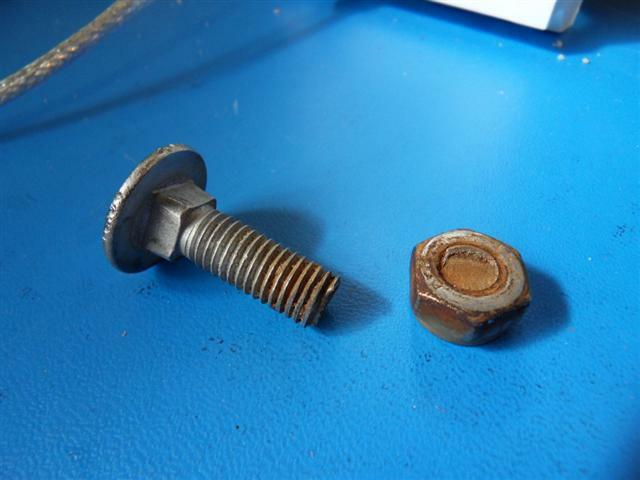 Fatigue failures in bolts almost always occur at the first thread in the nut: the point of maximum stress in all bolted fasteners. Because the crack may have been growing for some considerable time the fracture faces may rub together, producing a smooth or even highly polished appearance. Both examples shown are in carbon steel bolts but exactly the same situation occurs in stainless steel. For maximum fatigue resistance it is necessary to select one of the higher grades, e.g.A2-50 and A4-50 (the 50 is usually not marked) have low yield point and strength. Yield point in this material is only about half of the UTS, making it easy to deform when making up bolted joints. A2-70 and A4-70 are hard drawn, increasing yield point and strength. A2-80 and A4-80 have the highest yield point and strength due to being heavily hard drawn. They may have a tendency to brittleness and stress corrosion. 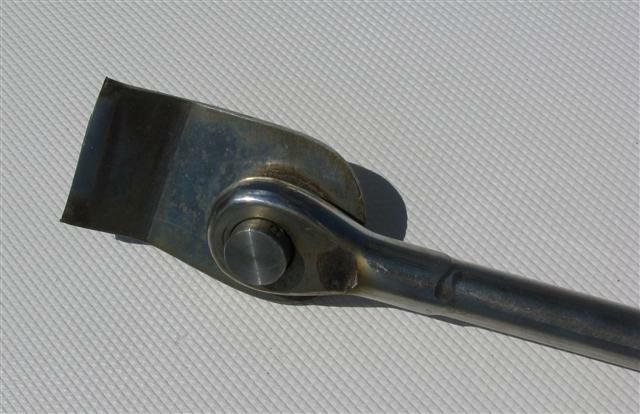 Four of the 24 bolts holding on one side of a beam hinge on a 12 year old Dragonfly 920 were found to have failed. This photograph shows the appearance of one of them and is typical of fatigue. 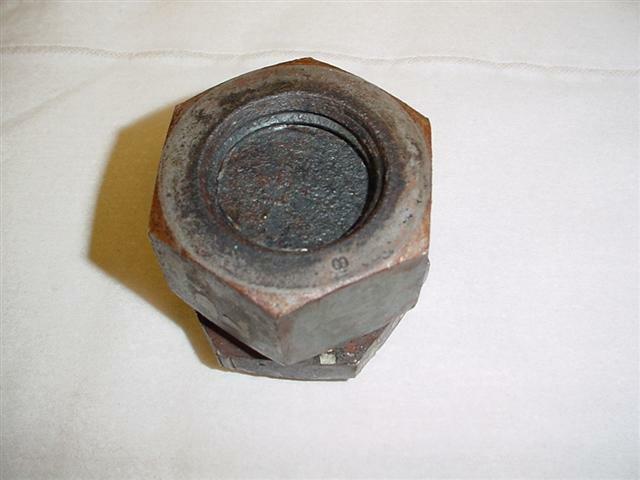 Note failure at the first thread inside the nut and the two-zone appearance. All 48 bolts were replaced with higher strength versions. The exhaust manifold is constructed from two concentric tubes welded to the flange that is bolted to the cylinder head. Exhaust gases flow through the central tube while cooling water passes through the annular space between the tubes. The weld between the inner tube and the flange is cracked. This led to water leakage into the bilge. 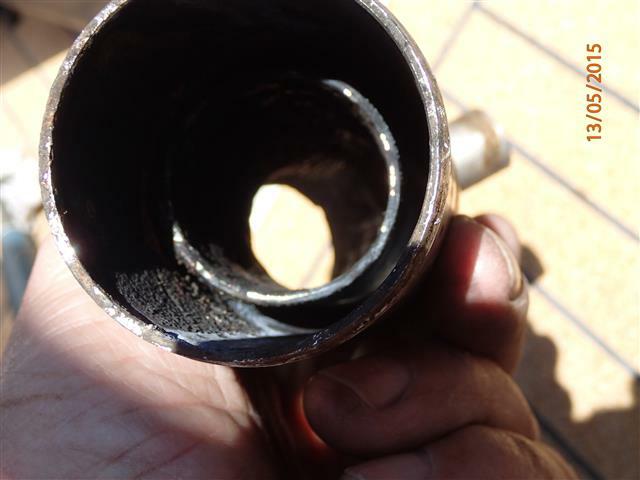 The cause in this case is not corrosion but fatigue. The flange is around 6 mm thick and the tube thickness is about 2 mm. As the manifold heats up the inner tube tries to expand but cannot, due to the restraint provided by the flange. Considerable stress is developed between the two. Over many repetitions this results in the formation of a fatigue crack.